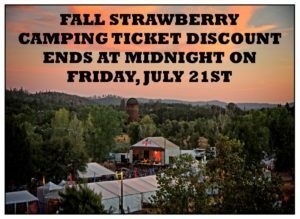 You can still get your discounted camping tickets to the Fall 2017 Strawberry Music Festival online until midnight, or by calling our office until 5pm, on Friday, July 21st. Visit the Tickets page of our website to see all ticket types and price tiers. Don’t wait until it’s too late!